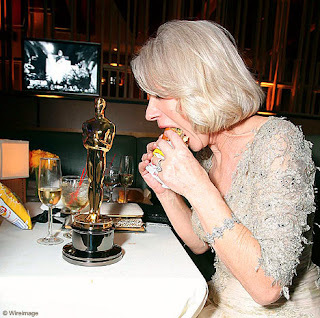 I love this picture of Helen Mirren chowing down on a big old burger at one of the parties following her Oscar win! Such a down-to-earth contrast between the glamour of the Oscars and the royalty of her role, and a woman who probably hasn't had a bite since breakfast -- before hair, makeup, dress-fitting, long limo ride and four-hour awards ceremony. Reminds me of another burger-loving Essex gal named Rachel Fuller. Enjoy, Helen -- and the bag of chips is a nice touch!